Gypsy - A long term personal project for fun. I picked up this IBM 7575 SCARA robot at a surplus auction cheap. I've done some re-fit on it using a Mesa 5i25/7i77 controller card driven with Machinekit (a fork of linuxCNC). Now I can drive it around a little and open/close the manipulator! Usually I call it Gypsy but sometimes Lennie if it tries to stupidly kill me which only happened once. I have no specific goal with this project other than to learn more about robots increase my nerd credibility score. 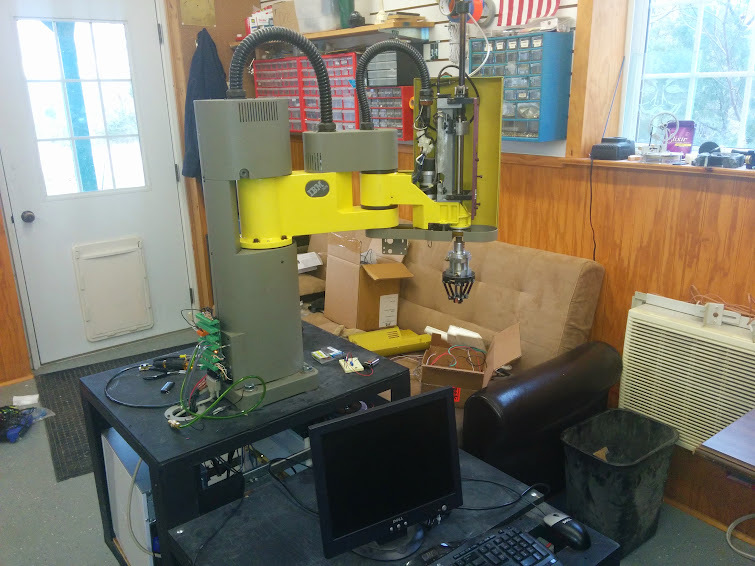 To that end, I'd like to start playing with the robot workbench, model the bot, and see if I can eventually produce trajectories that Machinekit could use to drive it. Documentation around Robot wb seems oriented to a 6-axis machine and this is a 4-axis. Tutorial is also a bit thin on detail. Maybe I can help with that as I go forward. Like I said, I have no master plan or timeline so if anyone has interesting ideas, helpful links, or cautionary tales, I'd welcome them. Re: Gypsy - A long term personal project for fun. Edit: linked to the image. I did a rough model. Not very detailed but enough to work with on the next phase. I would put it next to my toaster so it could load and unload the bread. perfect!! dubstar-04 wrote: I would put it next to my toaster so it could load and unload the bread. perfect!! Now why in the world would you want to squander the machines capabilities on toast when it would be far more practical next to the coffee maker putting sugar cubes into your cup o' joe. The working envelope is big enough to include both a toaster AND a coffee maker. All of the example I've seen use only revolute joints. The last link on this robot is prismatic. 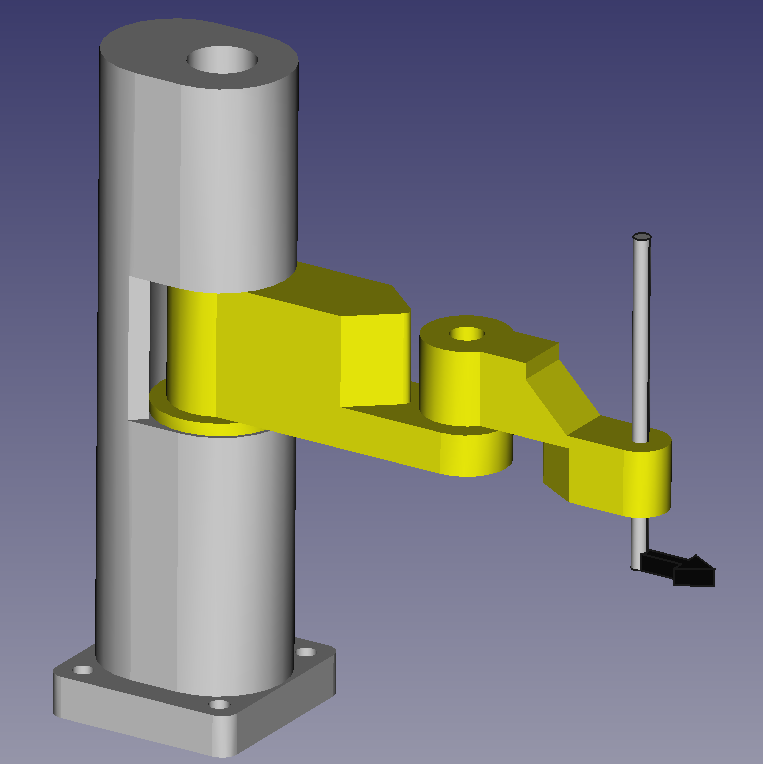 It moves the end effector up and down (Z axis). However, it also has another DOF which spins the end effector around the Z axis (roll). You can see the roll working in the video, but I don't know how to do the Z move yet. dubstar-04 wrote: Any more news? Not much. The Machinekit guys are doing some interesting things with ROS integration. I'm anxious to learn more about it but the learning curve is pretty steep. I've been working on Path a lot lately and I still think there's a huge opportunity for integration between Path and Robot WB but when it comes to Robot, my kung-fu is pretty weak. It would be really cool to have a basic cartesian robot example in the robot wb. Then we would have something to experiment with to simulate Path playout. This project has sat idle for almost two years. I got frustrated when I couldn't make the machine move in cartesian coordinates without errors. Machinekit/linuxcnc has two different movement modes. 'joint mode' allows you to jog individual motors and this worked perfectly. Once the individual joints are homed, you can switch into 'world mode' and jog in cartesian space. The kinematics are calculated automatically and everything should work. But for me, it didn't. I posted in lots of places but never found any help. I don't think people use these scarabots very much and, it turns out, mine is a little bit different. I finally dug into it again a couple weeks ago and had a breakthrough. Next step is to start learning something about ROS. Congratulations! This encourages me to start (again) with the retrofit of my CNC mill.